And if you wonder what's inside the starter unit or you need to change the brushes...it just takes 1 cable, 2 bolts to remove it and 2 bolts to open it up. 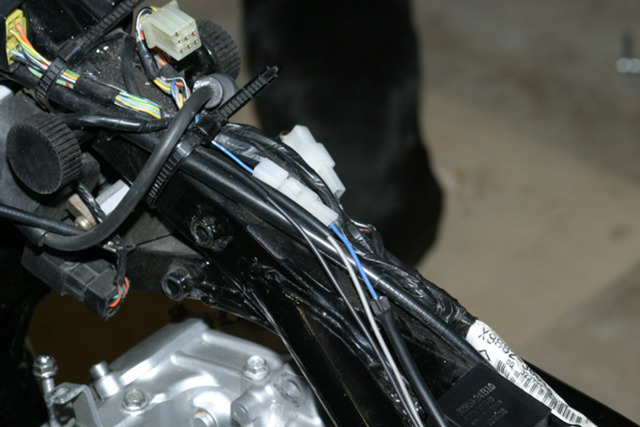 And the cables for the charging/ignition system go from under the seat...BETWEEN the battery and airbox...along the frame cradle...behind the front pulley cover...and end up here...not easy to get to on a stock bike. 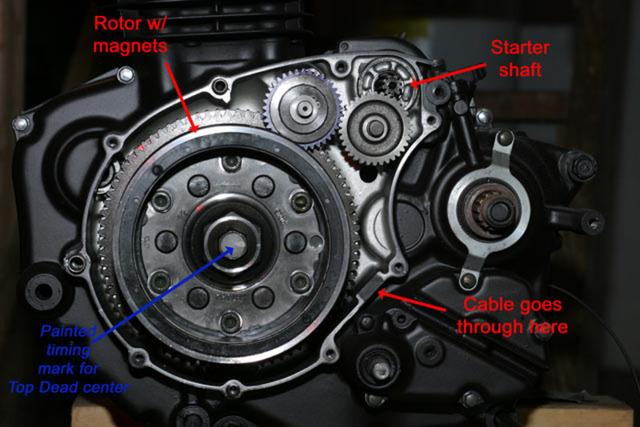 And the moving parts of the charging/ignition system are nothing more than rotating magnets. 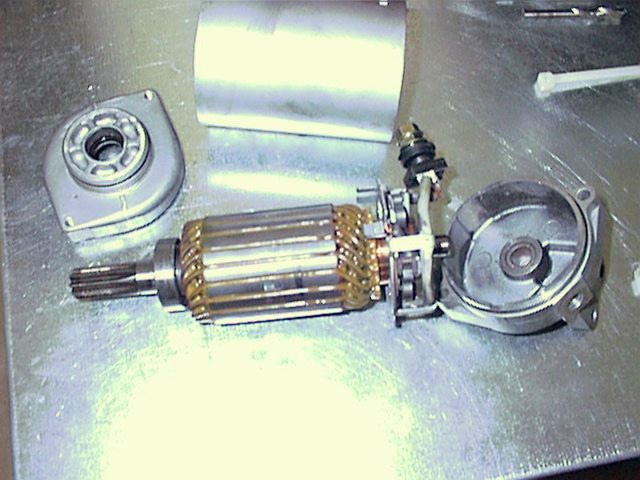 This is the rotor. 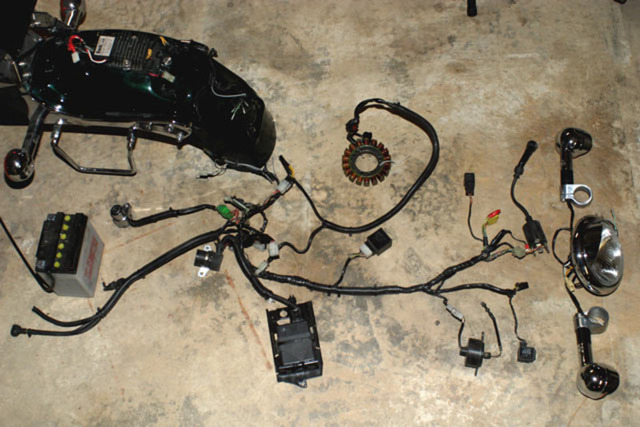 This induces the current flow in the alternator windings and also triggers the ignition pickup for a spark. In blue is the painted mark at 3:00, which is when the engine is at TDC on the compression stroke. And while we're on the subject...here is a crude tool that I made with scraps of metal for removing the plug to view the timing mark. I've thought about patenting this but the real reason I show this is that if you ever crack the plug by using a screwdriver and hammer...you'll wish you had this. 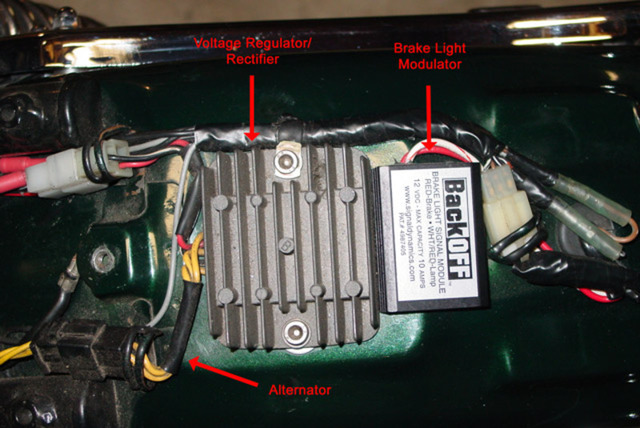 This is the voltage regulator/rectifier under the passenger seat...and there is brake light modulator too, which attaches with double sided tape. 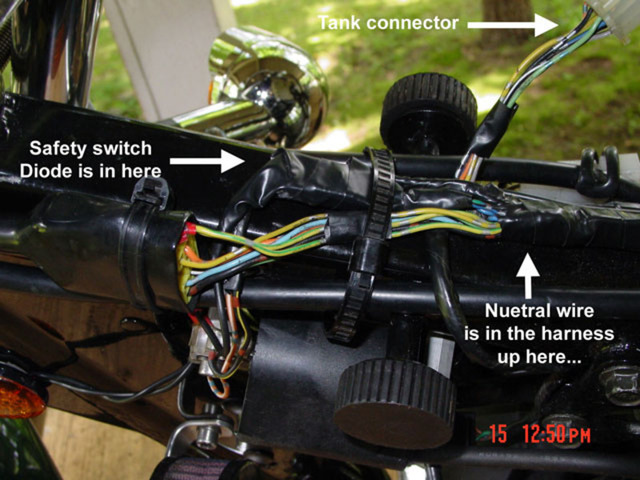 Can the ignition pickup be unscrewed and slotted for more advance ? 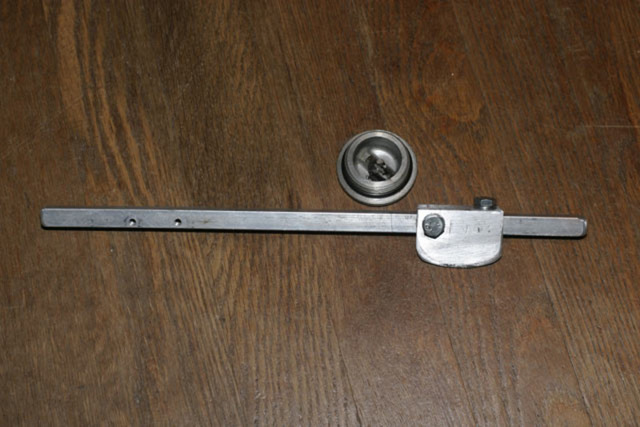 Having a mechanism for external adjustment would be much better. 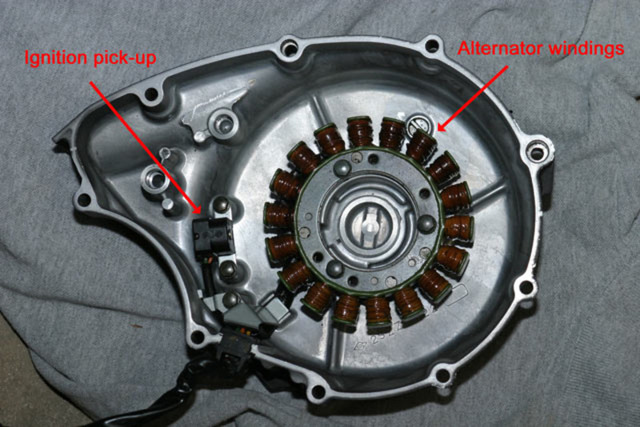 What is the purpose of the brake modulator? I know what modulators are suppose to do, but why for the brake light? Also where is the best place to buy a shop/repair manual?. In the JC Whitney catalog I saw a small unit 1"X 2" that turns the brake light into a strobe light when the brakes are applied. A good idea? There are many modulators for the brake light, and the one in JCW probably is similar. The purpose is to be seen, especially if you are sitting behind another vehicle at a stop. This causes the light to blink in different or irregular patterns...even some cars have this feature for the 3rd brake light. There are even bulbs that plug into the socket that do the something similar (my spouse has that one). The Back Off unit is probably the best known unit. Manual? A Clymer manual. Amazon.com, Wal Mart, Barnes & Nobles, and the dealer. But I have a Suzuki Service Manual that I bought from the dealer. Great display and super info. Thanks for taking the time my friend. 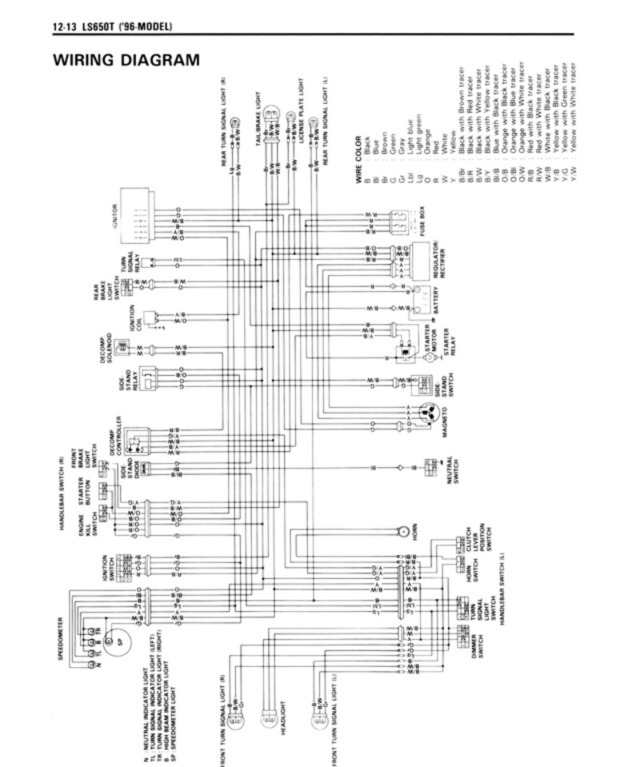 Does the Suzuki manual include diagnotics and trouble shooting of the electrical system? Do the after market manuals offer a comprehensive diagnosis as good as the Suzuki manual? Thanks. Have a good day. 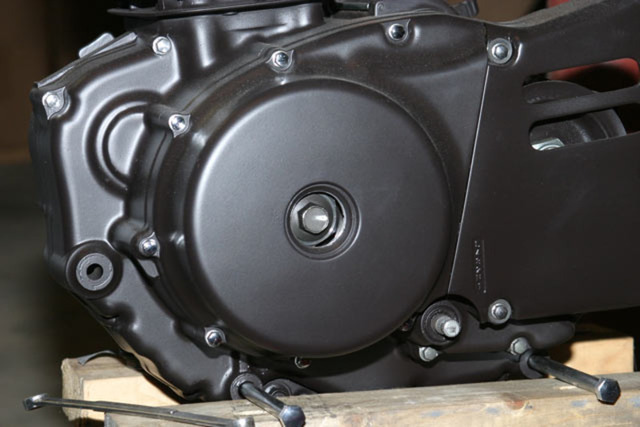 The Suzuki Service Manual is a real shop manual designed for the trained motorcycle mechanic. So the info is complete, but probably not the "lead you by the hand" kind of manual as the Clymer. 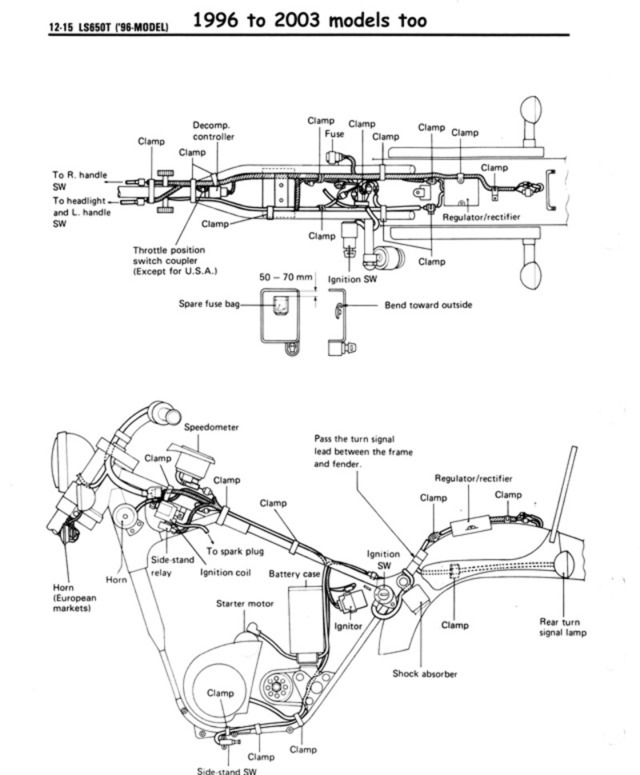 The manual is technically detailed for all Savage years, but for example, when it explains how to do the complete engine teardown, it sort of assumes that you'll know how to do the reverse operation and put it back together. So, it isn't for beginners. It is also a 7 ring loose leaf binder type manual so you can remove or add pages and costs about twice what the Clymer does. Since there are 2 Savages in our stable, I chose this manual. but, WHY do you take apart your bike every winter???? Not stupid, and most people think that I'm the one with the problem anway. Why? Don't know, it's just a hobby. I've been taking things apart all my life. I used to take things apart on my Dad's car and hope he'd never find out. It didn't matter what. An old appliance, an old stereo, or an old engine. Just to see how it works, and I've always been challenged by the idea of putting it back together in working order too. Another example....My clothes dryer died not long ago. I was sure it was a broken belt, but I had never ever been inside a dryer before...let alone one that was 18 years old. I couldn't see the broken belt but I had a hunch what it looked like. I found a replacement belt at an appliance store...it took me one hour start to finish and my dryer is running fine now. Cost me $15. No experience, no book, just what I like to do. But getting back to bikes...if I can't really enjoy riding my bike in bad weather, then what I really enjoy is wrenching my bike in bad weather....and when I take it apart, my little mind is going "What if"?